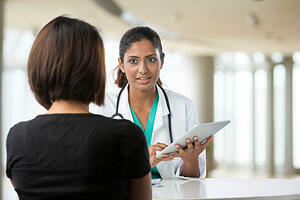 Doctor-Patient Communication: How Well do Physicians Listen to Patients? Doctor-patient communication plays a big role in how compliant a patient is with treatment and his or her outcomes. And identifying and understanding why a patient has made an appointment can encourage and make doctor-patient communication easier. However, recent research has revealed that physicians only ask patients what brings them in about 36 percent of the time, and when they do, it takes about 11 seconds for them to interrupt the patient. Researchers evaluated patient encounters with primary care and specialty physicians. They found that the patient’s agenda was elicited in 49 percent of primary care visits versus 20 percent of specialty care encounters. When the patient’s agenda was elicited, they were interrupted 63 percent of the time by primary care physicians and 80 percent of the time by specialty care physicians. The rate at which physicians interrupted patients and why could be due to the complexity of each patient and the physician’s practice, researchers argued. They also surmised that done with the patient’s best interest in mind, these interruptions could be beneficial to patients by serving to clarify or focus the conversation. The study’s results could be a by-product of multiple barriers to patient-centered communication, its authors noted. These include limited education on patient communication skills, time constraints or burnout. How do Physicians and Nurses Feel About Their Listening Skills? In contrast to the above research, according to a different study, the majority of physicians, registered nurses and advanced practice nurses said they often make a conscious effort to listen to their patients. In fact, 89 percent of nurses and APRNs and 87 percent of physicians surveyed gave their listening skills high marks. When those surveyed were asked what would help them improve their listening skills, they listed allowing more time for visits with patients, increasing their focus on listening and having communication skills training. One registered nurse who participated in the survey said if more physicians listened to patients, it could help with patient compliance. “Take the time to sit down, look your patient in the eye and say, 'Tell me what's going on.' Discuss the situation with them and then act upon it. The patient's perception of care is all important. If they perceive that they are receiving good care, then they are. And they are much more compliant," she said. Can Active Listening Improve Doctor-Patient Communication? Active listening seeks to use three skills: Paraphrasing the patient’s comments, asking clarifying questions and summarizing to ensure you’re on the same page. These skills will help clinicians understand the person without judgment. Rana L.A. Awdish and Leonard L. Berry suggest the following ways health systems can improve listening skills with all clinical staff. Share examples of how staff communicated well with a patient and how they did not. Offer communications curriculum to all staff — clinical and non clinical. Further, the American Medical Association (AMA) notes that the first few minutes of an appointment are precious because the patient often relays important information about the reason for their visit or symptoms.